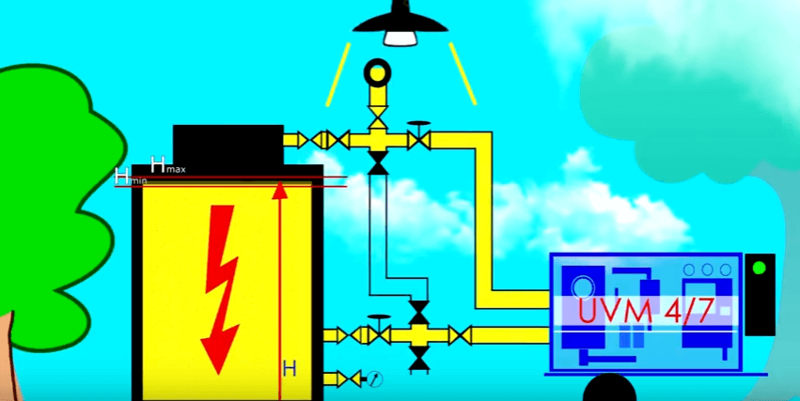 The system is equipped with a control cabinet and valves which allow to connect oil lines to the transformer and to process the oil so that no air is allows into the transformer. Attention! For preparation and connection of the TSS system and pipelines to the transformer, the transformer must be offline and the valves of the transformer must be closed! The upper and lower cross-pieces of the TSS system are connected to the transformer. The TSS pressure sensor is connected to an available port of the transformer. The required oil pipelines are connected to the transformer. The TSS system is powered up. From the control panel, the limits of the TSS operation are set. TSS is activated. The electromagnetic valves on the cross-pieces open. Oil processing commences thought the bypass line. The pipes are filled with oil, releasing air. When the temperature reaches 55 – 60 degree centigrade processing of oil in the transformer tank is commenced. After 15 to 30 minutes of stable operation the transformer may be put online and processing will proceed for the required duration of time.This is the method of online transformer servicing.